Texas laws allow the killing of a fetus to be prosecuted as murder, regardless of the fetus' stage of development, but they do not apply to abortions, the state's highest criminal court has ruled. Wednesday's ruling by the Court of Criminal Appeals rejected an appeal by Terence Lawrence, who said his right to due process was violated because he was prosecuted for two murders for killing a woman and her 4- to 6-week-old fetus. Tags: abortion, legal ruling, Texas, unborn To share or post to your site, click on "Post Link". Please mention / link to the ARRA News Service. Thanks! Update 11/24: Hope finds out FEMA trailers at airport not all bad: Hope collects $25,000 monthly rent. Salaries are paid to 75 workers FEMA has at Hope - monthly payroll costs are $416,755. They stay in the local motels, they eat in the local restaurants and buy things locally. ARRA Editor: You may not always agree with Peggy Noonan, but her opinion definitely get attention. She an the unique ability to express what many people are thinking and to do so in relatively few words. Although this Op/Ed piece appears to address Gov. Mitt Romney and his faith, it is clearly more than that. To illustrate the point, all references to current and previous named candidates have been removed. After reading these edited insights, you may wish to to read her complete article and to consider the article in light of all candidates - people made of clay and not prophets from on high. by Peggy Noonan, WSJ Opinion Journal: I was talking with an old friend . . . and she asked if I knew what religion a certain presidential candidate was. I replied that I didn't know and hoped I'd never find out. We started to laugh, and she nodded. I didn't mean it and yet I meant it, for we have come to an odd pass regarding candidates and their faith. It's not as if faith is unimportant, it's always important. But we are asking our political figures--mere flawed politicians--to put forward and talk about their faith to a degree that has become odd. We push them against the wall and do a kind of theological frisk on them. We didn't use to. . . . In 1968 we were, as now, a religious country. But when we walked to the polls, we thought we were about to hire a president, not a Bible study teacher. . . . There are some people who believe faith doesn't belong in politics. But it does, and it is there inextricably. The antislavery movement, the temperance movement, the civil rights movement, the antiabortion movement, all were political movements animated in large part by religious feeling. It's not that it doesn't matter. You bring your whole self into the polling booth, including your faith and your sense of right and wrong, good and bad, just as presidents bring their whole selves into the Oval Office. I can't imagine how a president could do his job without faith. But faith is also personal. You can be touched by a candidate's faith, or interested in his apparent lack of it. It's never wholly unimportant, but you should never see a politician as a leader of faith, and we should not ask a man who made his rise in the grubby world of politics to act as if he is an exemplar of his faith, or an explainer or defender of it. Tags: Election 2008, Peggy Noonan, Politics, religion To share or post to your site, click on "Post Link". Please mention / link to the ARRA News Service. Thanks! Fred Thompson, Republican Presidential Candidate: Border Security and Immigration Reform Plan In the post-9/11 world, immigration is much more of a national security issue. A government that cannot secure its borders and determine who may enter and who may not, fails in a fundamental responsibility. As we take steps to secure our borders and enforce our laws, we must also ensure that our immigration laws and policies advance our national interests in a variety of areas, and that the immigration process itself is as fair, efficient, and effective as possible. No Amnesty. Do not provide legal status to illegal aliens. Amnesty undermines U.S. law and policy, rewards bad behavior, and is unfair to the millions of immigrants who follow the law and are awaiting legal entry into the United States. In some cases, those law-abiding and aspiring immigrants have been waiting for several years. Doubling ICE agents handling interior enforcement, increasing the Border Patrol to at least 25,000 agents, and increasing detention space to incarcerate illegal aliens we arrest rather than letting them go with a promise to show up later for legal proceedings against them. Adding resources for the Department of Justice to prosecute alien smugglers, people involved in trafficking in false identification documents, and previously deported felons. Maximizing efforts to prosecute and convict members of criminal alien gangs, such as MS-13 and affiliated gangs. These gangs have brought unusual levels of violence to more than 30 U.S. states and have also become very active in drug-smuggling, gun-smuggling, and alien-smuggling. Implementing fully and making greater use of the expedited removal process already allowed under federal law. Enabling the Social Security Administration to share relevant information with immigration and law enforcement personnel in a manner that will support effective interior enforcement efforts. 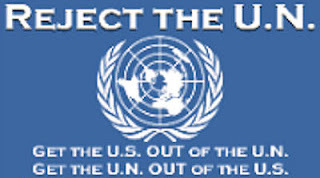 End Sanctuary Cities by cutting off discretionary federal grant funds as appropriate to any community that, by law, ordinance, executive order, or other formal policy directs its public officials not to comply with the provisions of 8 USC 1373 and 8 USC 1644, which prohibit any state or local government from restricting in any way communications with the Department of Homeland Security "regarding the immigration status, lawful or unlawful, of an alien in the United States." Deny discretionary Federal education grants as appropriate to public universities that violate federal law by offering in-state tuition rates to illegal aliens without also offering identical benefits to United States citizens, regardless of whether or not they live in the state, as required by 8 USC 1623. Deny discretionary Federal grants as appropriate to states and local governments that violate federal law by offering public benefits to illegal aliens, as prohibited by 8 USC 1621(a). Reduce the Jobs Incentive. Ensure employee verification by requiring that all U.S. employers use the Department of Homeland Security's electronic database (the E-Verify system) to confirm that a prospective employee is authorized to work in the U.S. Now that the technology is proven, provide sufficient resources to make the system as thorough, fast, accurate, and easy-to-use as possible. Add to the Cost of Hiring Illegal Aliens. Deny a tax deduction to employers for the wages they pay to illegal aliens, thereby dramatically increasing the real cost of employing illegal aliens. Businesses that do not play by the rules should not be rewarded under our tax system. Bolster Border Security. Finish building the 854-mile wall along the border by 2010 as required by 8 USC 1103. Extend the wall beyond that as appropriate and deploy new technologies and additional resources to enhance detection and rapid apprehension along our borders by 2012. Increased Prosecution. Deploy the additional assets outlined above to prosecute alien smugglers ("coyotes"), alien gang members, previously deported felons, and aliens who have repeatedly violated our immigration laws much more vigorously. Rigorous Entry/Exit Tracking. Complete the implementation of a system to track visa entrants and exits, as has been required by federal law for more than ten years, and connect it to the FBI's National Crime Information Center (NCIC), in order to curb visa overstays and permit more effective enforcement. Maximize Program Efficiency. Reduce the backlogs and streamline the process for immigrants and employers who seek to follow the law. Also, simplify and expedite the application processes for temporary visas. This can be accomplished by hiring more personnel at Citizenship and Immigration Services and the FBI. Caps for any category of temporary work visa would be increased as appropriate, if it could be demonstrated that there are no Americans capable and willing to do the jobs. Enhanced Reporting. Improve reporting to the government by businesses that rely on temporary workers so that the government can track whether the visa holder remains employed. Modernize Immigration Law/Policy. Change the nature of our legal immigration system to welcome immigrants who can be economic contributors to our country, are willing to learn the English language, and want to assimilate. Reduce the scope of chain migration by giving family preference in the allocation of lawful permanent resident status only to spouses and minor children of U.S. citizens, and no one else (no siblings, no parents, no adult children, etc.). Eliminate the diversity visa lottery. English As Official Language. Make English the official language of the United States to promote assimilation and legal immigrants' success, and require English proficiency in order for any foreign person to be granted lawful permanent resident status. Freedom from Political Oppression. Preserve U.S. laws and policies to ensure that the United States remains a beacon and a haven for persons fleeing political oppression, while assuring appropriate admission standards are maintained. Service to Country. Place those foreign persons who are lawfully present in the country and who serve honorably in the Armed Forces of the United States on a faster, surer track to U.S. citizenship. Tags: border security, Election 2008, Fred Thompson, immigration reform, presidential candidate To share or post to your site, click on "Post Link". Please mention / link to the ARRA News Service. Thanks! Tags: children, Gary Varvel, Indianapolis, military, political cartoon To share or post to your site, click on "Post Link". Please mention / link to the ARRA News Service. Thanks! Abraham Lincoln (1863): The year that is drawing towards its close, has been filled with the blessings of fruitful fields and healthful skies. 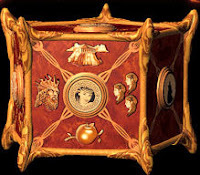 To these bounties, which are so constantly enjoyed that we are prone to forget the source from which they come, others have been added, which are of so extraordinary a nature, that they cannot fail to penetrate and soften even the heart which is habitually insensible to the ever watchful providence of Almighty God. In the midst of a civil war of unequaled magnitude and severity, which has sometimes seemed to foreign States to invite and to provoke their aggression, peace has been preserved with all nations, order has been maintained, the laws have been respected and obeyed, and harmony has prevailed everywhere except in the theater of military conflict; while that theater has been greatly contracted by the advancing armies and navies of the Union. Needful diversions of wealth and of strength from the fields of peaceful industry to the national defense, have not arrested the plough, the shuttle or the ship; the axe has enlarged the borders of our settlements, and the mines, as well of iron and coal as of the precious metals, have yielded even more abundantly than heretofore. Population has steadily increased, notwithstanding the waste that has been made in the camp, the siege and the battlefield; and the country, rejoicing in the consciousness of augmented strength and vigor, is permitted to expect continuance of years with large increase of freedom. No human counsel hath devised nor hath any mortal hand worked out these great things. They are the gracious gifts of the Most High God, who, while dealing with us in anger for our sins, hath nevertheless remembered mercy. It has seemed to me fit and proper that they should be solemnly, reverently and gratefully acknowledged as with one heart and one voice by the whole American People. I do therefore invite my fellow citizens in every part of the United States, and also those who are at sea and those who are sojourning in foreign lands, to set apart and observe the last Thursday of November next, as a day of Thanksgiving and Praise to our beneficent Father who dwelleth in the Heavens. And I recommend to them that while offering up the ascriptions justly due to Him for such singular deliverances and blessings, they do also, with humble penitence for our national perverseness and disobedience, commend to His tender care all those who have become widows, orphans, mourners or sufferers in the lamentable civil strife in which we are unavoidably engaged, and fervently implore the interposition of the Almighty Hand to heal the wounds of the nation and to restore it as soon as may be consistent with the Divine purposes to the full enjoyment of peace, harmony, tranquillity and Union. Tags: Abraham Lincoln, President, Republican, Thanksgiving Proclamation To share or post to your site, click on "Post Link". Please mention / link to the ARRA News Service. Thanks! Our corn did prove well, and, God be praised, we had a good increase of Indian corn, and our barley indifferent good, but our peas not worth the gathering, for we feared they were too late sown. They came up very well, and blossomed, but the sun parched them in the blossom. Edward Winslow, December 11, 1621, in A Journal of the Pilgrims at Plymouth (Mourt’s Relation: A Relation or Journal of the English Plantation settled at Plymouth in New England, by certain English adventurers both merchants and others.) Dwight Heath, ed. New York: Corinth Books, 1963, p. 82. 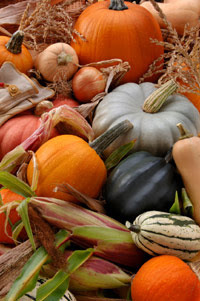 Tags: First Thanksgiving, Pilgrims, Plymouth To share or post to your site, click on "Post Link". Please mention / link to the ARRA News Service. Thanks! The latest Gallup poll shows Congress’ approval rating dropped 9 points in November, to 20%. According to Gallup, this is just 2 points above the lowest approval that poll has ever recorded, dating back to 1974. Americans have clearly noticed the Democrats’ record of failure over the last month. At a press conference this morning Reps. David Obey (D-WI) and John Murtha (D-PA) tried to blame the lack of a bridge funding for the troops on Senate Republicans for not approving the House bill mandating withdrawal requirements. Of course, it is Democrats’ insistence on coupling Iraq funding with unacceptable withdrawal timetables that has prevented our soldiers from getting the funds they need. The Christian Science Monitor reported yesterday, that Congress’ failure to pass funding may force the Pentagon to “close dozens of domestic military bases and imperil the livelihoods of tens of thousands of defense workers” to keep U.S. forces fighting. Murtha went on to charge the administration with allowing veterans to return to inadequate military facilities and care. But Democrats have refused to send the Military Construction-Veterans Affairs appropriations bill to the president, even though it is complete and supported by overwhelming majorities of both houses. Tags: Christian Values, David Obey, federal funding, Gallup Poll, Iraq War, John Murtha, military funding, US Congress To share or post to your site, click on "Post Link". Please mention / link to the ARRA News Service. Thanks! Tags: Iraq War, support troops, veterans, wounded To share or post to your site, click on "Post Link". Please mention / link to the ARRA News Service. Thanks! In the first Pajamas Media War on Terror Conversation, Presidential candidate Fred Thompson discusses the current situations in Iran, Iraq and Pakistan. The senator/actor also explains why he thinks the recent Hollywood anti-war films are box office failures. Joining Thompson are PJM CEO Roger L. Simon and Bob Owens of Confederate Yankee. 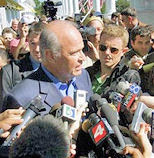 Tags: Election 2008, Fred Thompson, global war, Pajamas Media, presidential candidate, video, War on Terror To share or post to your site, click on "Post Link". Please mention / link to the ARRA News Service. Thanks! by Rev. Louis P. Sheldon, Chairman, Traditional Values Coalition: During World War II, Hollywood produced hundreds of patriotic films to support the war effort. Many actors and actresses also enlisted to serve their country on the front lines. One of the most famous Hollywood directors of the time, Frank Capra, produced the “Why We Fight” series to help explain why our nation was fighting the Nazi and Japanese. Hollywood was united in our nation’s joint effort to defeat the threat of worldwide fascism. But, times have changed. Now, Hollywood producers and directors are still going to war but this time they’re waging war against our own military and against our nation’s intelligence gathering agencies. Does the word “treason” have any meaning? “Redacted,” however, isn’t the only Hollywood attack in recent months on our battle against worldwide Islamo-fascism. Hollywood has given us “The Shooter,” with Mark Wahlberg, which attacks our intelligence services; “The Bourne Ultimatum,” another attack upon our intelligence agencies; “Lions for Lambs,” an anti-military diatribe starring ultra-liberal Robert Redford; “In the Valley of Elah,” about a man who fights the military bureaucracy; and “Rendition” starring Reese Witherspoon. In this film, she plays the wife of an Egyptian man who is kidnapped by our government and sent to a secret “torture” camp overseas. The themes of these films are all the same: Our counterintelligence efforts against Islamic terrorism are evil and should be exposed; and our soldiers are murderous thugs. Soon, we’ll be seeing movies about psychotic ex-soldiers back from Iraq who become serial killers or rapists on our nation’s streets. This is how Hollywood treated ex-Vietnam veterans. I expect the liberals in Hollywood to follow this same strategy in demeaning the courageous men and women who risked their lives for us in Iraq and Afghanistan. Frank Capra would be ashamed of what’s happened to Hollywood. We should express our anger at these attacks on our military and our counterterrorism efforts by refusing to purchase tickets to these hateful, treasonous films. And, we should let Mark Cuban and Brian de Palma know exactly how we feel about their horrific film smearing the U.S. Marine Corps. Tags: anti-military, anti-war, Hollywood, Louis Seheldon, Tradional Family Values Coalition, TVA To share or post to your site, click on "Post Link". Please mention / link to the ARRA News Service. Thanks! Update Nov 19: The Arkansas filing period for the Presidential primary ended today. Six GOP candidates filed: Rudy Giuliani, Mike Huckabee, John McCain, Ron Paul, Mitt Romney, and Fred Thompson. The following candidates did not file: Duncan Hunter, Tom Tancredo, and Alan Keyes. Tancredo cited the high RPA filing fee and that he felt Huckabee should win his home state. ARRA Editor: The Republican Party of Arkansas (RPA) has been expressing to potential donors that they need money. I guess they decided to fill their coffers using "ballot taxes" - oops I mean filing fees. Since the RPA Charman Dennis Milligan has "personally" endorsed Former Arkansas Gov. Mike Huckabee, maybe the RPA will give Huckabee an RPA in-state "membership" discount on his filing fee. Hat Tip to Ballot Access News for the following background story and to Stephen a commenter who used the term "Ballot Tax:"
Until 2007, there had never been a party-imposed fee for running in a presidential primary in any state, higher than $5,000. However, the South Carolina Republican Party broke that pattern by setting its filing fee at $25,000 for candidates who filed before May 2007, and $35,000 for candidates who filed later. Now the Arkansas Republican Party has copied this idea, to a certain extent, and is charging $15,000. The Arkansas Republican Party does not pay for the presidential primary; the fee is just a way for the party to make money. So far, the only Republicans who have paid the Arkansas $15,000 fee are John McCain, Ron Paul, Mitt Romney and Fred Thompson. However, filing doesn’t end until Monday, November 19. The Democratic National Committee has set a ceiling of $2,500 that any state Democratic Party may charge presidential candidates. Of course, in most states, filing fees don’t go to the parties anyway. In most states they go to election administrators. Tags: Arkansas, Arkansas Republican Party, Dennis Milligan, filing fee, GOP, Mike Huckabee, presidential candidates, RPA To share or post to your site, click on "Post Link". Please mention / link to the ARRA News Service. Thanks! Gives two kids to government, castigates social workers for letting family flee. WorldNetDaily: A court decision that categorized homeschooling as "child welfare endangerment" has assigned custody of two children to the government and criticized a social services agency for allowing a family to flee Germany, where homeschooling remains illegal. The decision from the Federal High Court in Karlsruhe, Germany's highest court, was reported by the German edition of Agence France-Presse, as well as Netwerk Bildungsfreiheit, an organization that advocates for homeschoolers against the repression in Germany . . . The court found the city and its social services agencies were "obviously unsuited" to the task of enforcing mandatory public school attendance and rather than protecting against "child welfare endangerment," the city allowed the family to move to Austria where the two children now are being educated by an "uncertified" mother. . . . [Read More] ARRA Comment: This court ruling sound like German decision in the 1930s and 40s that oppressed its people? God help the German people - their courts an governments are not! Tags: Germany, home school, parent rights To share or post to your site, click on "Post Link". Please mention / link to the ARRA News Service. Thanks! The Senate is on Thanksgiving break for the next two weeks. However, there will be no formal recess, as Majority Leader Harry Reid has decided to hold the periodic pro forma sessions instead of a typical recess to prevent President Bush from making any recess appointments during the Thanksgiving break. The Senate reconvened at 9 AM today for a pro forma session; will also convene pro forma sessions on Nov. 23, 27 & Nov. 29. The Senate is scheduled to resume legislative business at 2 PM on Dec. 3. But with Reid's track record who knows! In the wake of the latest failed Iraq votes in Congress, an astonishing number of articles appear in the mainstream media today with positive news from Iraq. The New York Times and The Washington Post both report a sharp decline in attacks today (though the Post has put it on page A14), the Los Angeles Times reports “war-weary Sunnis and Shiites are joining hands at the local level to protect their communities from militants on both sides,” Reuters notes that Iraqi ambulance drivers are no longer quite so busy, and AFP even profiles a revitalized nightlife in Baghdad. In fact, it seems as if the most negative news concerning Iraq this morning comes from Washington rather than Baghdad. Thanks to Congress’ failure to pass dedicated funding for the troops into next year, The Christian Science Monitor reports the Pentagon may be forced to “close dozens of domestic military bases and imperil the livelihoods of tens of thousands of defense workers” to keep U.S. forces fighting. ICYMI On Friday: Senate voted on a series of cloture motions, all of which failed to garner the 60 votes needed. - In the first vote the Senate failed, 45-53, to invoke cloture on the motion to proceed to the GOP emergency supplemental appropriations bill (S. 2340), which would have provided $70 billion in war funding through the spring. - Cloture on the motion to proceed to the House-passed supplemental funding bill (H.R. 4156) also failed, 53-45. The House bill would have provided $50 billion in war funding but included irresponsible troop withdrawal requirements. - The Senate also failed, 55-42, to invoke cloture on the Harkin substitute amendment to the farm bill (H.R. 2419). Work on the bill remains stalled. However using limited floor time, Senate Majority Leader Harry Reid led democrats to express their enjoyment over attending ex-Klansman Sen. Robert Byrd's surprise birthday party the previous evening. First elected in 1958, making him the longest-serving member of the Senate. Byrd is currently the President pro tempore of the Senate and third in the line of succession for the Presidency. It is interesting that in 2007, liberal Sen. Majority leader Harry Reid (D-NV) could wax nostalgically on the Senate floor about Sen. Byrd (D-WV) birthday before the whole world on C-SPAN without repercussions. However, when Sen. Trent Lott (R-MS) nostalgic words at a birthday party in December 2002 about Sen. Strom Thurmond (R-SC), who ran for president as a segregationist in 1948, caused a public uproar and cost Lott the majority leader's post. Tags: Harry Reid, Ex-Klansman Honored, Robert Byrd, birthday, US Congress, US House, US Senate, Washington D.C. To share or post to your site, click on "Post Link". Please mention / link to the ARRA News Service. Thanks! by Bobby Eberle: Over the past year or so, every time the phrase "immigration reform" was uttered in Washington, the American public knew to brace for the worst. No matter what we said, it appeared that our "leaders" weren't listening. The wishes of Americans were clear: border security first, no amnesty, and enforce existing laws. It's not rocket science. Now, it appears that Congress may actually be listening. With all the time wasted on "comprehensive" immigration reform, a new plan moving through the House of Representatives has garnered bi-partisan support, and it addresses immigration reform from a border security perspective. Tags: Bobby Eberle, immigration reform, Save Act To share or post to your site, click on "Post Link". Please mention / link to the ARRA News Service. Thanks! Sometimes the truth in humor, isn't really so funny. Tags: economic cost, illegal aliens, political cartoon, political humor, political satire, Rob Smith, US Debt To share or post to your site, click on "Post Link". Please mention / link to the ARRA News Service. Thanks! During an exclusive interview on Fox News Sunday this morning, former Arkansas Governor and Presidential Candidate Mike Huckabee unveiled a new television ad featuring actor Chuck Norris that will begin airing in Iowa on Monday, November 19. The 60-second TV ad, called 'Chuck Norris Approved," features Norris' endorsement of Huckabee as a "principled, authentic conservative." The ad also discusses Huckabee's support for the Fair Tax, securing the border, and the 2nd amendment. Tags: campaign ad, Chuck Norris, Election 2008, Mike Huckabee, presidential candidate, Republican To share or post to your site, click on "Post Link". Please mention / link to the ARRA News Service. Thanks! Farm Subsidies Going To The Wealthy including Rep.Marion Berry? $20B In Tax Dollars Is Allocated To Keep Farms Afloat - And Some Lawmakers Are Benefiting by Sharyl Attkinson (CBS News): Each year, taxpayers fork over about $20 billion in farm subsidies to help keep America's farms up and running. But over the years, more and more of the payments have gone to Fortune 500 companies, the wealthy - and even members of Congress, CBS News correspondent Sharyl Attkisson reports. Ken Cook, who researches the issue, says it makes about as much sense as putting a milk bucket under a bull. “The big farms get most of the money. Ten percent of the beneficiaries get over 70 percent of the payments . . . Even the members of Congress who vote on farm subsidies and earn $165,200 government salaries can get payments. A dozen of them or their close family have gotten a total of $6.2 million dollars over 10 years. 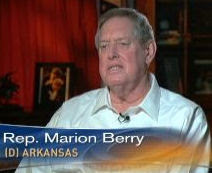 One of them is Arkansas Rep. Marion Berry. He's grown rice his whole life, and has collected subsidies from the start. Today, he and his family members have interests in several farm corporations. Attkisson asked him: “You and your family’s interests received almost $2.4 million in federal payments from 1999 to 2005 according to records?" Berry said: “I don’t have any idea. That sounds like an awful lot of money to me.” Whatever the amount, most Americans would hardly envision Berry as the disadvantaged farmer. “Can you tell me what your net worth is?” Attkisson asked. “My net worth? I don’t have any idea,” Barry replied. “Well, it’s not very much I know.” "This range says $1.7 million to $6.6 million,” Attkisson read to him. “That’s probably pretty close,” Berry said. Tags: Arkansas, CBS, Congressional Pork, farm subsidies, Marion Berry, US Congress To share or post to your site, click on "Post Link". Please mention / link to the ARRA News Service. Thanks!